Arms: Sable, on a chief or. three ravens of the first, all proper. The Corbin Family is an old Virginia family, but the story begins in England, in Of Annington, with Thomas Corbin who was born in 1517. His ancestors may be traced to the Norman conquest of England in 1066. His descendant, a Henry Corbin, was born in Of, Hall End, Warwiskshire, England in 1629. He came to Virginia Colony on the ship Charity and settled in Stratton Major, King & Queen Co. (so named for his home in Enland). He served in the House of Burgesses in 1657, 59 and 60. The Corbins built the estate Peckatom, featuring a Georgian Mansion that sat on the shore of the Patomac. In 1645 he married Alice Eltonhead in Lancaster County, Virginia. They had the following childern: Laetitia, 1657; Winifred, 1662; Anne, 1664; John, 1657; Gawin, 1659; and Thomas, 1669. Henry Corbin was one of the most powerful persons in the colony. He had been in the "Country Club" that John Lee had established. Laetitia (called Lettice by her family)[PHOTO] married the landowner next door: Sir Richard Lee, and their descendants included General Henry "Light Horse Harry" Lee, a Revolutionary officer, and General Robert E. Lee of the Mexican and Civil Wars. His son Colonel Gawin Corbin served as Burgess in 1700, 02, and 18. Henry died in Westmoreland County in 1675, and Gawin inherited Peckatom. My Great Great Grandfather William Corbin was born about in Virgina in 1822. He came to Kentucky and married Sarah Lytle of Kentucky before 1844. They are seen in the 1850 Washington County Census with four children: John S, James A. Elizabeth F, and William T. , also in the household is Susan Lytle, Sarah's elder sister. 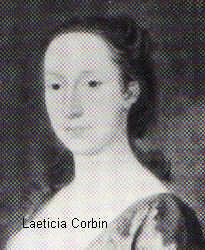 research "The Corbin Family of Virginia. "Virginia Magazine of History and Biography. 29(1921): 244.